I think I saw this on facebook, and it is awesome. I haven’t crochet in a long time but I’m going to try it. Awesome Jane! Glad I could inspire you to pick up the hook again. You are welcome. Enjoy. Great! What color are you thinking? Thank you for letting me know, Cheryl. I will look in to it! Absolutely lovely and I’m sure I have yarn in my stash to do this! It’s possible it’ll be next in my rotation. 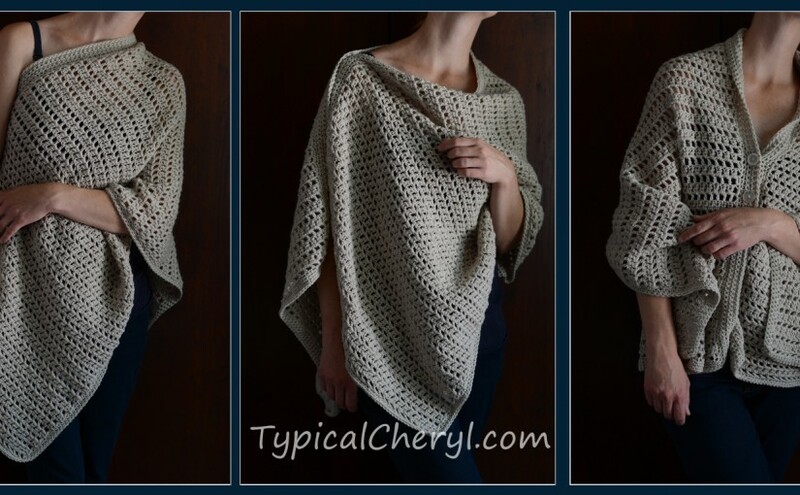 Love this pattern can’t wait to try it! 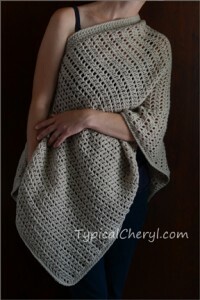 About how many skeins of bernat baby sport will it take to make this? Perfect! Thank you for your fast reply, I’m going to order it right now! You are welcome. I used the “economical big ball” size (350g / 12.3 oz, 1148 meters / 1256 yards). I am not sure if there are other sizes available. Enjoy the wrap! I love the simplicity and sophistication of this wrap. I just finished a shawl and I’m anxious about what to do next. This has settled it for me. Thanks for this great pattern. 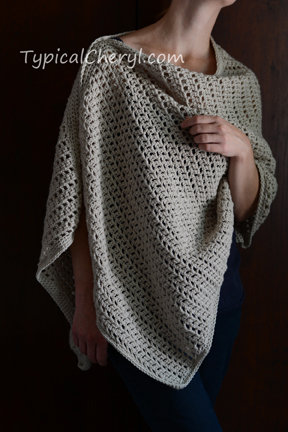 Hi, would like to try this wrap but using James C Brett Marble Dk. How many metres does this take up? Hi Sally! I have a post about the yarn I use here: http://typicalcheryl.com/stash-worthy-yarn/ It is a light weight (3 gauge) yarn and it comes in an “economical big ball” size weighing in at 350g / 12.3 oz, 1148 meters / 1256 yards. This wrap uses most, but not the entire ball. I have made two of these and haven’t started with a full ball yet. I am currently working on my third wrap. When I am finished I could update with further details. For now, I hope this helps. Have a great day! Just ran across this on Pinterest when I was looking for a good project to work on while traveling later this month. This looks perfect, and it will be perfect to wear while traveling, too! Can’t wait to get started on it. Great, Pam! So happy to hear it. Enjoy your traveling and your new wrap. Thank you for stopping by and sharing your thoughts! Next Next post: Welcome OYS Friends!